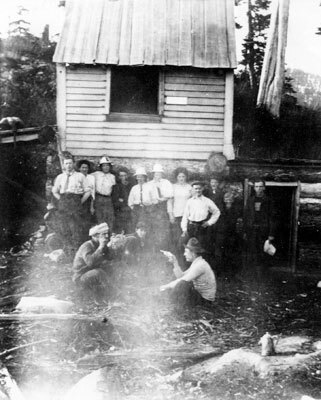 A Grouse Mountain shack erected by W.J. McGuigan, the windows, stove, and equipment were all carried to the top. People in the photo include (L-R):- W.J. McGuigan, Miss Macfarlane, Miss Lucy McGeer, Mr. Jim McGeer, Miss N. McGeer, Miss Margaret Macfarlane, Miss Schwengers, Mr. Harry Austin, Miss Cowan (a school teacher), and at end two unknown. Seated:- Gerry McGeer and Harley Watkins.